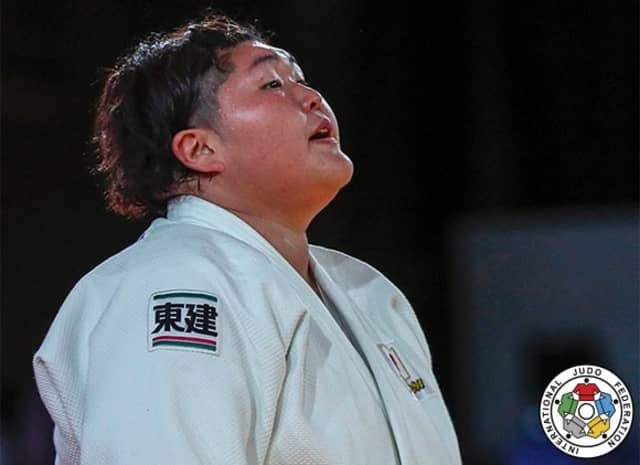 The first and last final of the day opposed the +78kg world number one ASAHINA Sarah (JPN), who eliminated Ortiz Idalys (CUB) in the semi-final, and world number two Larisa CERIC (BIH), who took the advantage over the Dutch Tessie SAVELKOULS to access the final. In front of her father, who was cheering from the stands, ASAHINA, who was the ultimate favourite, took control of the match with a sasae-tsuri-komi-ashi for a waza-ari. A little later she scored again waza-ari with the same technique, which she followed on the floor with an immobilisation for ippon. 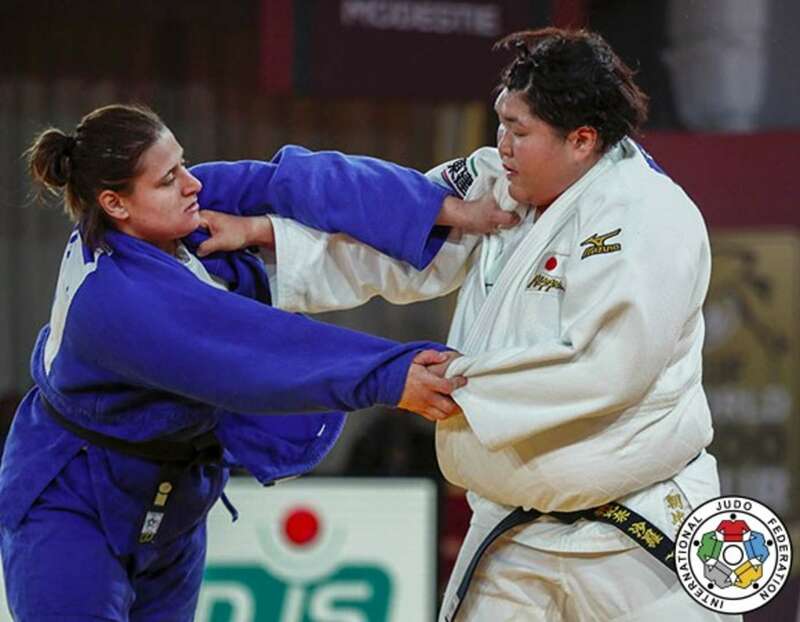 The first bronze medal contest saw Nihel CHEIKH ROUHOU (TUN) opposed to Tessie SAVELKOULS (NED). More than two minutes were necessary to see the first major intervention of the referee as a shido was given to the Tunisian for passivity. With 33 seconds before the end, a second shido was awarded to CHEIKH ROUHOU again for passivity. It was time for the golden score. The match seemed to be in good hands for SAVELKOULS, definitely more active than her opponent but as she was launching an other drop-seoi-nage, CHEIKH ROUHOU remained stable on her legs and countered SAVELKOULS to score a waza-ari that was confirmed by the video refereeing. In the second bronze medal contest, the junior first year, Romane DICKO (FRA) faced the 2012 Olympic Champion Idalys Ortiz of Cuba. Ortiz was the first in action with a drop-seoi-nage for no score and was close to score again with a counterattack a handful of seconds later. Even if that second attempt was not successful, the experienced Cuban immediately followed on the floor to apply a shime-waza technique for ippon and win another major medal on the occasion of a world championships. At the end of the second day of competition, the IJF President, Mr. Marius Vizer, declared: "We have had two amazing days of competition here in Marrakech on the occasion of the Open World Championships. Today ASAHINA Sarah won the gold and yesterday Teddy Riner won his tenth world title. I want to congratulate both of them for their success as well as all the medallists and the participants. I want to thank the Moroccan authorities and to thank the Moroccan Judo Federation for having organized such a successful competition. We will soon be back in Morocco for some of our major events." After an exceptional first day on Saturday that saw the coronation for the tenth time of Teddy Riner, king of the world, it was the women's turn to enter the tatami of the Palais des Congrs in Marrakech, Morocco, for the second day of the Open Judo World Championships: 18 athletes for a title and, as always, a lofty prize money figure equal to the men. Despite the absence of some of the best judoka on the international circuit, the level was very high today in Marrakech, since the top three in the world rankings were engaged. 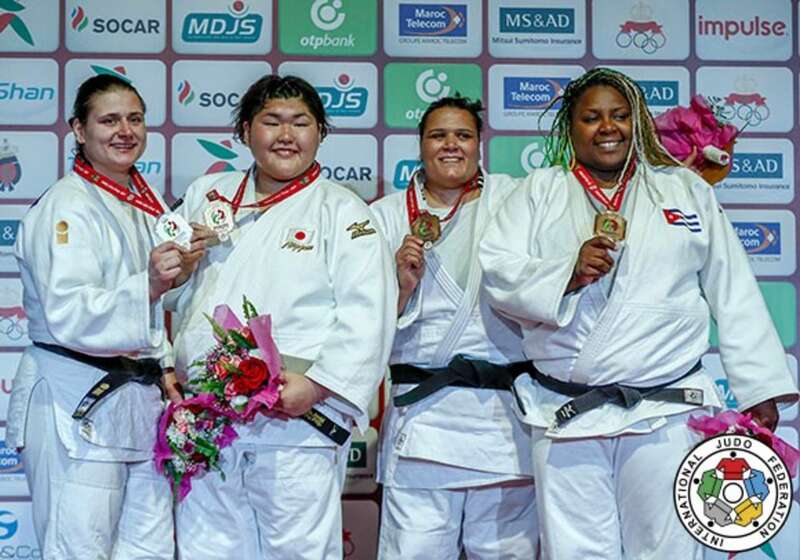 Thus the young Japanese Asahina Sarah, vice-world champion in early September in Budapest and who has lost only one fight since December 2016 (it was in Budapest precisely) was in Marrakech ready to clinch her first world title. Larisa Ceric (BIH), 26, winner of the last Zagreb Grand Prix was also among the favourites, while Tessie Savelkouls of the Netherlands, seventh in Rio a little over a year ago, fifth in the World Championship this year, and recent winner of the Grand Slam Abu Dhabi, showed an interesting rise in the optics of this Open World Championship. It was not too surprising to find in the last four of the competition, the three above-named as well as the eternal double World Champion (2013, 2014) and 2012 Olympic Champion, the Cuban Ortiz Idalys who never comes for nothing. Just before the final black, the now ten times World Champion, Teddy Riner, was presented by the Dutch Federation President, Mr. Felix Thieme and the former Dutch Judo Federation President, Mr. Jos Hel, with the Anton Geesink Award. Anton Geesink was the first non-Asian who became world and Olympic judo champion in the heavyweight category. During the Olympic Games in Tokyo in 1964 he defeated the Japanese Kaminaga Akio. Geesink was three time World Champion, he got 21 European titles and one Olympic gold medal. He was IOC member, honorary member of the European and International Judo Federation and was a tenth dan judoka. The Kokushikan University in Japan honored him with the honorary doctoral degree. Anton Geesink passed away in 2010. He was 76 years old. The Anton Geesink award has been presented until now to Jacques Rogge, to Erica Terpstra and to Louis van Gaal. 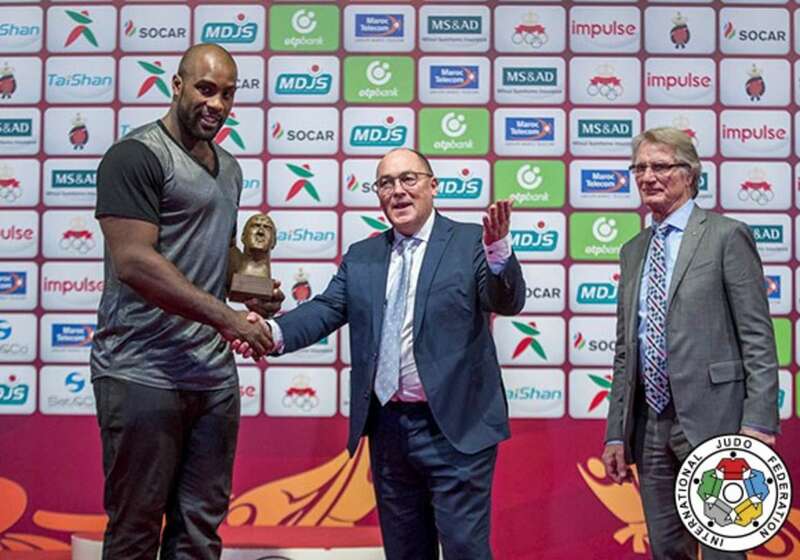 The fourth award was presented today to Teddy Riner. Mr. Jos Hel and Mr. Felix Thieme declared: "The French heavyweight Teddy Riner (27 years old) is the most successful judoka ever. He is two-time Olympic champion (2012 in London and 2016 in Rio de Janeiro). The heavyweight is the only judoka with 10 world titles (a record) and he also won 5 European championships. "Riner is the Anton Geesink of his time. He is a well-trained top athlete who has, with his charisma, an enormous impact on young judokas. His popularity is so great that he is treated like a superstar in France and Japan. "Just like Anton Geesink in his time, Teddy has been unbeatable for years. 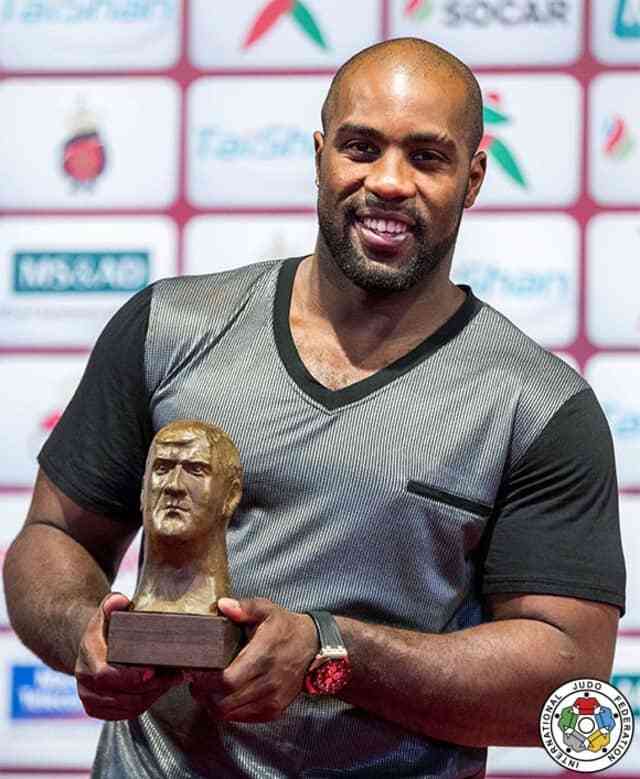 Teddy Riner has a brilliant list of honours, charisma, and his attitude on the tatami makes him an example for all judokas and an excellent candidate for the Anton Geesink Award." After having received his prize, Teddy Riner declared: "Who doesn't know the name of Anton Geesink, in the judo world but also outside of judo? He is an icon, a hero of our sport and of all sports. I feel very honored for having received that prestigious prize." After two days of amazing judo in Morocco, the IJF World Judo Tour will resume next weekend in the city of The Hague, Netherlands for a newly established Judo Grand Prix. The best athletes in the world will meet in the 14 weight divisions to collect points for the world ranking list. A few days ago a masterclass led by Rio Olympic bronze medalist Anicka van Emden (NED) was held in the city of The Hague. 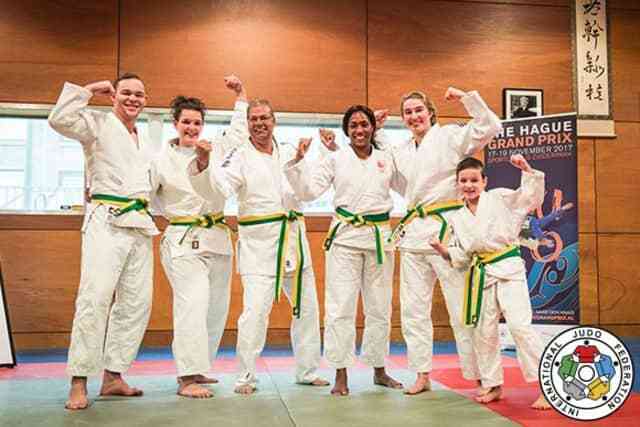 In the build-up towards The Hague Grand Prix, next weekend, Olympic medallist Anicka van Emden introduced the Alderman of city of The Hague, Mr. Rabin Baldewsingh, to the beautiful sport of judo. Mr. Baldewsingh stepped on to the tatami for an intense masterclass by Van Emden, who was assisted by famous and local born judoka such as Carola Uilenhoed, Simeon Catharina and Evelien Berndsen. Van Emden, who ended her successful career after the Rio Olympics, was impressed by his performance. "He has a lot of strength in his arms, so it wasn't easy". Mr. Baldewsingh enjoyed his introduction in judo. "What a magnificent sport. I am exhausted, but it was a great honour to step onto the tatami with an Olympic medal winning judoka." The masterclass was held at the local judo club Lu Gia Jen. The club is involved in the organisation of the IJF World Tour event. Both Evelien Berndsen (who will compete in The Hague at -70 kg) and Simeon Catharina (world champion -18 -100 kg, but currently injured) regularly train at Lu Gia Jen. The Hague Grand Prix will take place from 17-19 November and marks the return of the IJF World Tour to The Netherlands. Over 260 judoka from almost 50 countries are expected to compete in The Hague in the quest for valuable points for the World Ranking List. Among the entries for The Hague are world ranking leaders Urantsetseg Munkhbat (MGL/-48 kg), Aleksandar Kukolj (SRB/-90 kg) and Dutchmen Frank de Wit (-81 kg) and Michael Korrel (-100 kg).